This recipe was recommended by my friend Cynthia, who has adapted it from Yotam Ottolenghi’s, and I really like it. 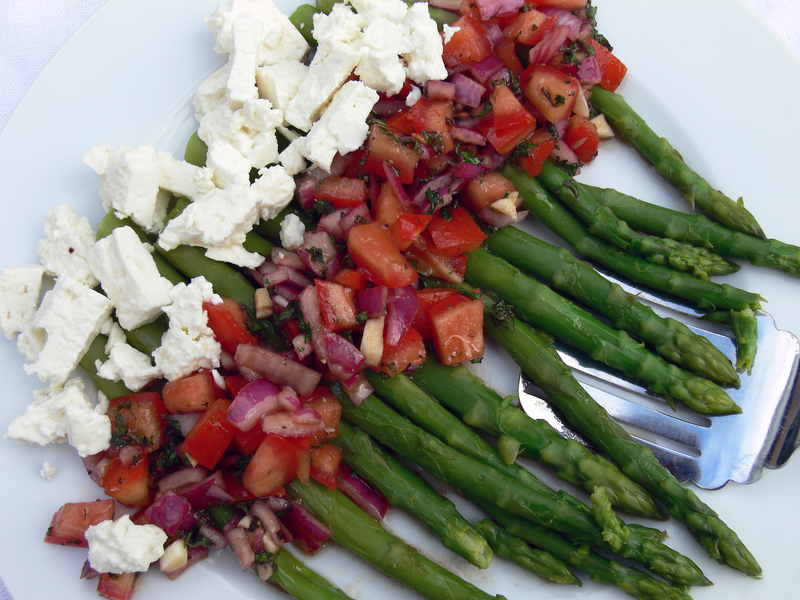 Cynthia says ‘it’s quick and easy, looks great and tastes even better!’ The asparagus is served with a really fresh tasting salsa of tomatoes, onions, vinegars and herbs, alongside crumbled cheese. I used feta but I think it would also work with goats cheese, and Yotam suggests Orkney or Ticklemore cheese (never tried them – let me know if you do!) The dish goes well with bread to mop up the salsa (particularly baguette I reckon) or a potato salad. I love the part baked baguettes you can buy from supermarkets and finish off in the oven. They keep for ages and can be frozen. Anyway here is the recipe…Serves 2 – 4. Put the onion and tomatoes in a bowl with the garlic, both vinegars, herbs, oil and a pinch of salt. Boil or steam asparagus for 2 or 3 minutes. Spoon the salsa over the asparagus and top with the crumbled cheese. Season to taste. This tasty dish is courtesy of my friend Louise who made it during a pasta making lesson (although I have made it with shop-bought tagliatelle). 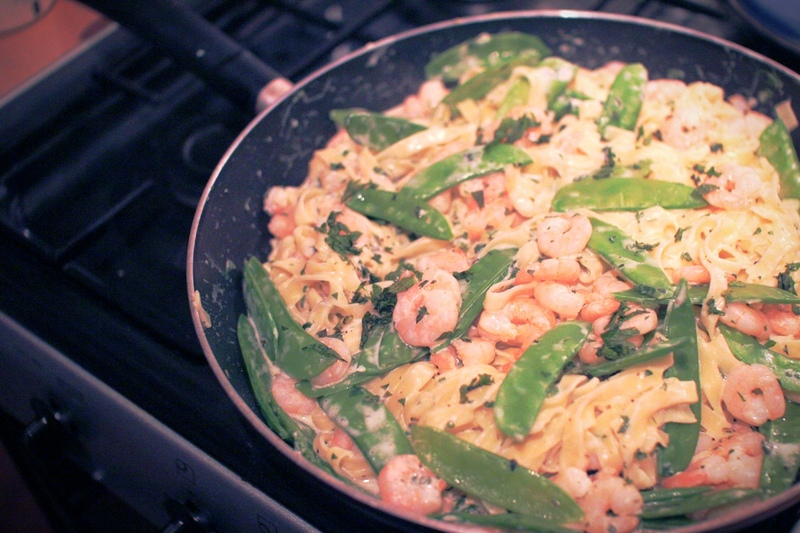 It combines the pasta with succulent prawns, mange tout, mint, garlic and creme fraiche. Super easy and quick (unless like Louise you made the pasta…)! Don’t scrimp on the mint as it needs lots. Quick time saving tip about garlic – if crushing it, you do not need to peel it first, as only the inside of the clove will come out and the skin will stay inside. Thanks for the recipe Louise! Serves 4. Gently heat the oil in a pan. Add the garlic and mange tout and cook gently for 3 minutes. Add the remaining ingredients, season well and cook gently for 1 minute, then toss with the hot pasta. Garnish with more fresh mint. 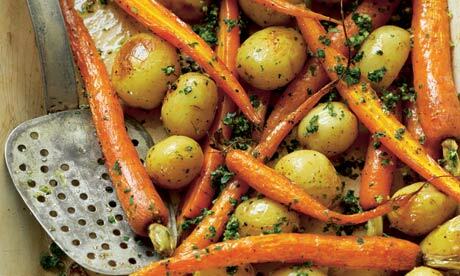 This carrots and potatoes with gremolata recipe (courtesy of Hugh Fearnley-Whittingstall) makes a gorgeous side dish. Gremolata is an Italian mix, very simply parsley, lemon zest and garlic, and it beautifully livens up the veg. You could have the veg alongside a Sunday roast, and Hugh reckons it also goes well with eggs. Serves 4. Heat the oven to 190C/375F/gas mark 6. Put the carrots and potatoes in a large roasting dish. Pour over the oil, season well and stir to coat. Roast for about 45 minutes. Meanwhile make the gremolata. Roughly chop the garlic, add the parsley and lemon zest to the board, and chop and mix until fairly fine. Remove the veg from the oven once they are tender and golden brown in places. Toss the veg with the gremolata, so the heat ever-so-slightly takes the edge off the garlic. Add some salt and pepper, if needed, and serve. Preheat the oven to 180 degrees / gas mark 4 and line a 12-hole muffin tin with cupcake cases. Using an electric mixer, or by hand, cream your butter and sugar together until light and fluffy (or just stir it a bit like I did). Gently beat in the egg, a pinch of salt, the vanilla extract, and, if using, red food colouring. In a separate bowl, mix together the cocoa and flour and fold half of it into your butter mix, followed by half the buttermilk. Repeat with the remaining flour and buttermilk until you have a gorgeous smooth texture. In a small bowl, mix your bicarbonate of soda and white wine vinegar together so it fizzes up, and stir this into your cake mix. 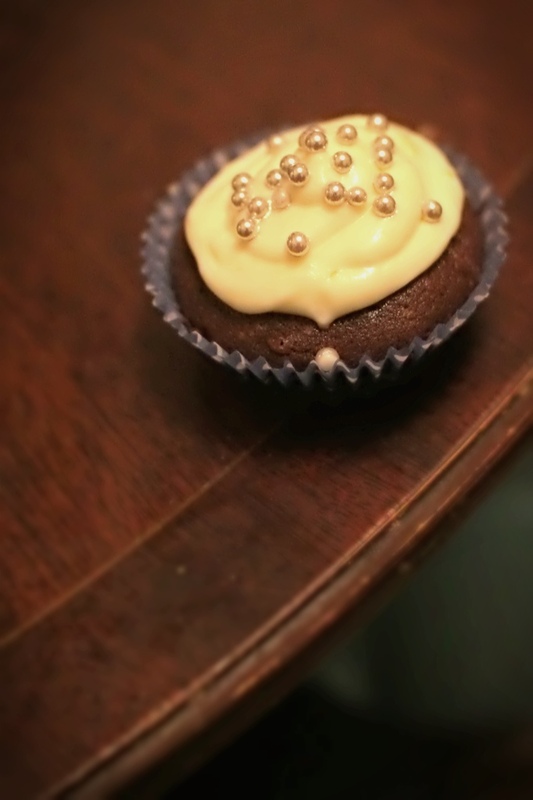 Divide the mixture between your cupcake cases and bake in the oven for 20-25 minutes. To check they’re cooked through, insert a skewer into the center of a cake — if it comes out clean, they’re perfect, If not, just pop them back into the oven for another couple of minutes. Let them cool for 5 minutes in the tin, then transfer to a wire rack to cool completely while you make your frosting. Put all your frosting ingredients into a bowl and mix together until smooth and creamy, or whiz in a food processor until smooth, creamy and thick enough to spoon on to the cupcakes (once cool). Alternatively you could pipe the frosting on with a piping bag and nozzle. Cook the fish fingers according to the pack instructions. Combine all the tartar sauce ingredients in whatever quantity you like (approx 1 small gherkin, 1 teaspoon of capers, half a shallot and 2 teaspoons of mayo for two sandwiches). 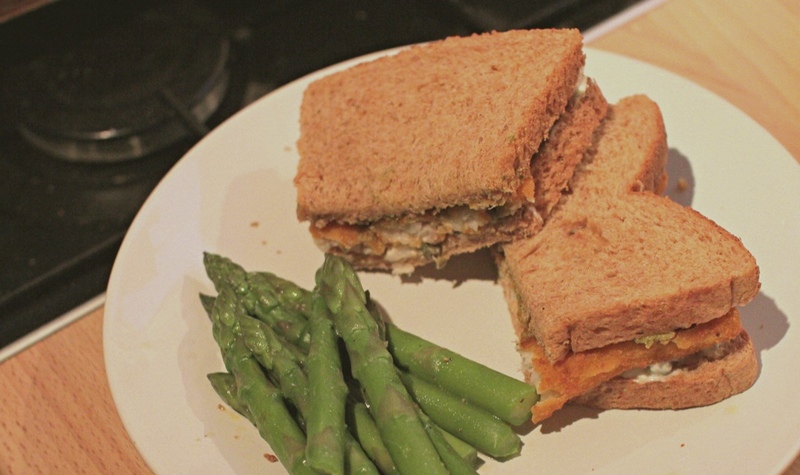 Spread some tartar sauce on one slice of bread, top with four fish fingers and another slice of bread spread with plenty of basil pesto. Serve with salad or buttered asparagus.